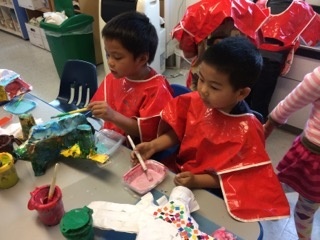 This year, the Chinese Kindergarten Red’s class project for Arts Night was titled “Travel Around the World.” For this project, students designed and created their own airplanes, using recycled materials. Each individual plane was different, but fit nicely into the overall class theme. Throughout the project, the students created a blueprint, documented their own work, reflected on their progress, and made changes accordingly. Students were able to choose from different mediums to construct their airplanes. To generate interest, the class read the book Egg Drop together. The story is about an egg that wants to fly, but fails. The children brainstormed different ways to help the egg fly. After discussing together, the children agreed to create their own flying machines. Then, they designed their unique airplanes by drawing blueprints. They were able to reference pictures of different airplanes to help them design their own. 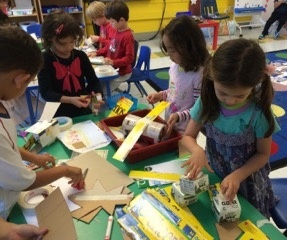 After the children created their blueprint, they were introduced to 10 different recycled materials, including milk cartons, popsicle sticks, yogurt cups, foam balls, and more. Using scaffolding, the children constructed their airplanes. At the end of day, they reflected on what they did, and they drew the steps they took. The children also learned to use iPads to take photos of their work, and learned to save them to their own album to document their progress. 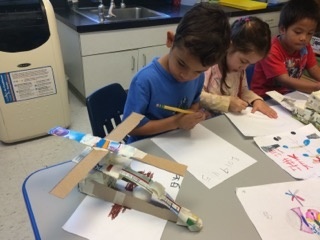 When the children came back the next day, they discussed problems they were having, such as “my wings can’t stay up,” and “my airplane isn’t balanced.” The class brainstormed different ideas to resolve the issues. In this project, children had the opportunity to explore different mediums and practice different skills. 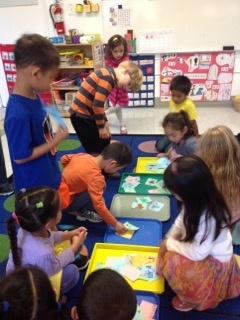 After they mastered a specific skill, they could teach it to their classmates who needed that skill to solve a problem. Some of the skills included balancing the wings and figuring out how to make the airplane stand still. After they finished constructing their airplanes, the children used paper mache to cover their plane and define its shape. This process took a few days because children often went over the plane a few times to make sure it was completely covered. 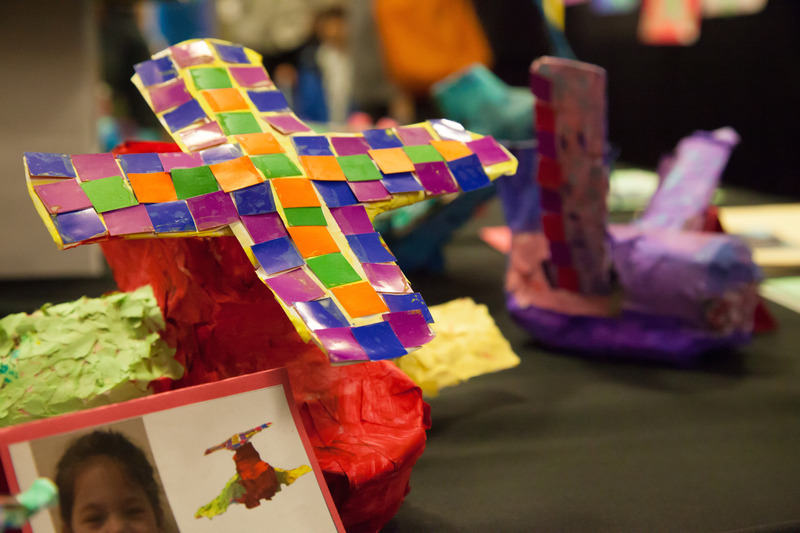 The children drew a design for their airplane, and they used paint, mosaic squares, and collage to decorate them. Some of the concepts that they incorporated into their designs included symmetry and patterns, which they studied in September and October. Throughout the project, we invited parents to share about their cultural backgrounds. The children explored 17 different countries through food, music, dance, and games. At the end of the project, each child chose a destination that they want to visit and colored that country’s flag. 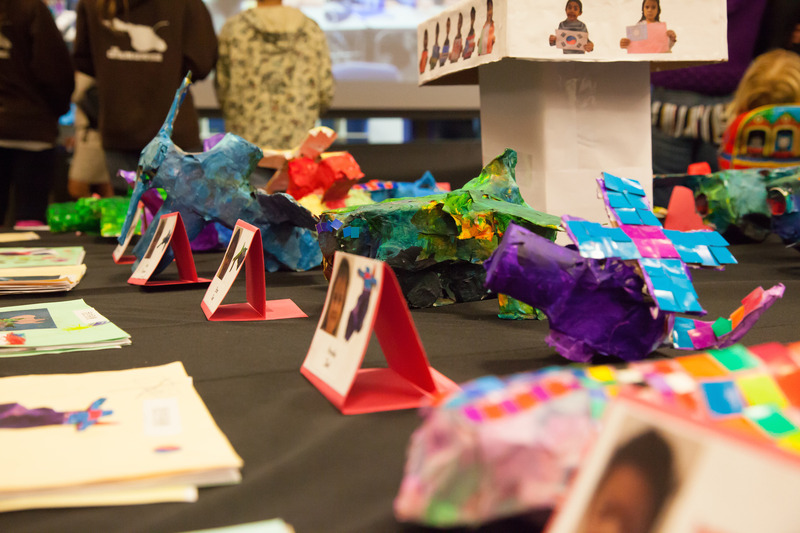 Together, the children created the “ISTP International Airport,” a place where children can dream about traveling around the world.